In a large mixing ball, combine all the meatball ingredients and mix well. Roll into the size you want - I like the size of a poker chip. The size is your choice, a tip, wet your hands to create a smooth ball. 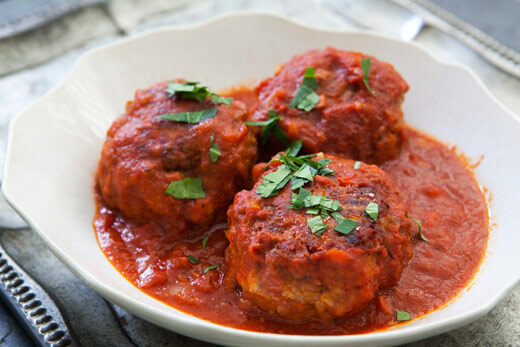 Place the balls in the fridge for about 5 minutes to allow them to firm up - so they don't fall apart during the cooking. While the meatballs are in the fridge, start the tomato sauce. In a pot heat the oil over medium heat, and saute the onion, celery, carrot until the onions are translucent. Add the garlic, bay leaf and cook for about a minute more. Add the tomatoes and continue to cook on low heat. And continue to cook. In a large skillet, add butter and heat until almost smoking point, add the meatballs. Continue to cook the meatballs so they get a nice golden brown colour, about 8 minutes. 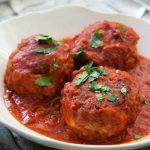 At this stage they won't be fully cooked so you will be adding the tomato sauce to the fry pan (with the meatballs), bring to the boil, lower heat and continue to simmer for about 5 minutes. You can serve these with a pasta like penne or spaghetti, or on their own in a bowl or with zoodles (zucchini noodles).